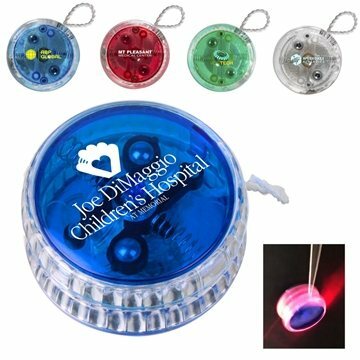 Round out another successful marketing campaign and have your brand name imprinted on these fun light-up yo-yos! Great for night time tricks and performances, these yoyos are a clever way to present your company name and logo. Features two ball bearings to allow for an easy return, as well as a red light that turns on when in use. A great giveaway for kids, and can be customized with a one location imprint. Light up your life and light up the night! These Yoyo's are great and we didn't break the bank either! It looked exactly like I imagined it would look. I liked the clarity of the logo the most. What I liked the most. Cost and Quality Used these as a give-away at the humane society pet walk. they were a hit.